Happy Friday and thanks for closing another wonderful week with #ThatBusinessShow with your Host, Jamie Meloni! We also were lucky to have in our lovely Co-Host Stella Guidicelli! As the week is coming to an end, you can check out our weekly photo recap posted here soon! But, as for today, we had a great guest with great information! 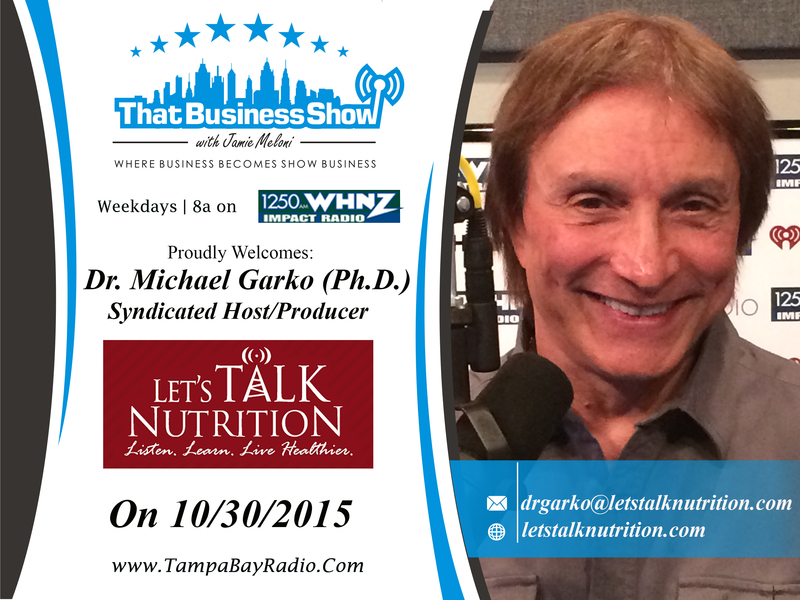 Featuring here on #ThatBusinessShow on the #MorningAir was Dr. Michael Garko! Dr. Michael Garko is an award-winning educator and researcher, consultant, writer and journalist. He is also a nationally syndicated radio host-producer. Thank you for joining us here on #ThatBusinessShow, and if you missed the show live on the #MorningAir, then head to http://www.tampabayradio.com now to listen to the show! Alternatively, head to Jamie’s YouTube Channel at http://www.youtube.com/jamieleoni! Coming on the #MorningAir with Jamie Meloni today was Dr. Michael Garko! Dr. Michael Garko is an award-winning educator and researcher, consultant, writer and journalist. He is also a nationally syndicated radio host-producer. Dr. Garko was awarded his Ph.D. in communication from Florida State University. The depth and breadth of Dr. Garko’s experience and background as an educator, researcher, consultant, writer, radio host-producer and journalist is extensive, spanning over three decades. Dr. Garko has published numerous articles in scholarly journals. He has published a monthly article over the past ten years for Health and Wellness, which can be accessed at www.letstalknutrition.com. He also writes articles for health and wellness magazines. As the radio host and producer of the Let’s Talk Nutrition, Dr. Garko often appears on television and other radio shows talking about a variety of health topics. He also serves a journalistic role reporting on important public health issues, including infectious and chronic diseases, the obesity epidemic, health and aging in America, health of the planet, food safety, health care, food deserts in major metropolitan cities and solutions to unhealthy lifestyle and dietary behaviors, among other important public health issues. Make sure to tune into his radio show, Let’s Talk nutrition right after #ThatBusinessShow on #1250WHNZ at 8am! Happy Thursday! We hope you are enjoying your morning today! Here at #ThatBusinessShow, we are dedicated to getting professionals from our community on the #MorningAir to promote what they do for the community! Showcasing success and talent, #ThatBusinessShow invites you to come onto the show! Head to http://www.tampabayradio.com if you’d like to come on, just fill out the contact form, or email our show producer at christian@tampabayradio.com! 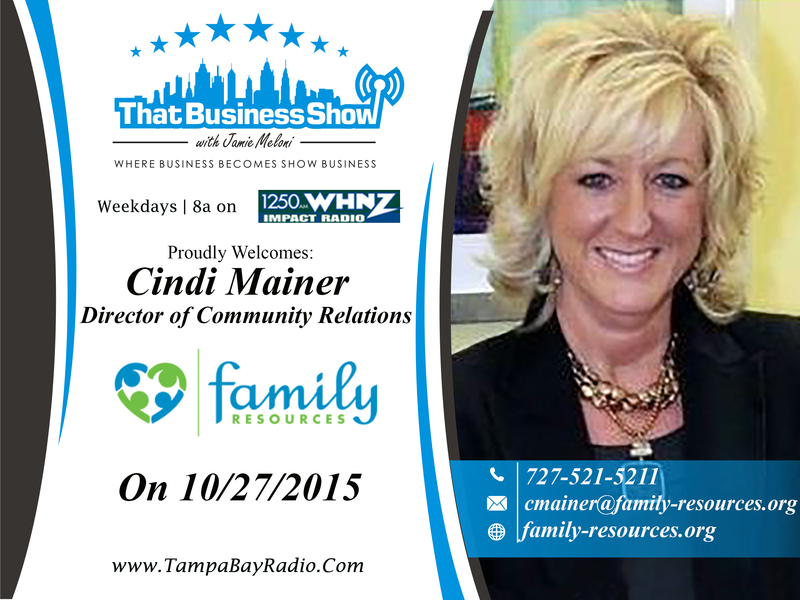 Today on the show we welcomed Suzanne Thomas, Patrice & Associates Franchise Owner! We also had on Dr. Areej Salem, a Board-Certified (American Board of Obstetrics & Gynecology, American Board of Integrative & Holistic Medicine) Holistic Medicine Provider with Zhoy Vitality Center! If you missed #ThatBusinessShow on the #MorningAir, head to http://www.tampabayradio.com now to listen to the show on demand! Make sure to also check out Jamie’s YouTube channel at http://www.youtube.com/jamiemeloni to watch any of the livstreams on demand! And if you aren’t already, head to Twitter and follow Jamie at @jamie_meloni! Our first guest on the show was Suzanne Thomas, Patrice & Associates Franchise Owner! Coming on the #MorningAir with Jamie, she discussed her role as the owner of a Patrice & Associates Branch, telling the listeners that for over 25 years, Patrice & Associates has been the nations largest recruiting firm for businesses looking to hire new employees! Suzanne is well prepared to help clients achieve their employment goals, having spent more than 25 years in sales and customer service driven industries, where she developed a passion for helping others and creating close client relationships. Suzanne began describing the upcoming holiday season, and with it approaching, businesses brace for a boost in sales and traffic by hiring seasonal positions by the thousands. These seasonal positions can be a valuable, foot in the door opportunity for an employee to demonstrate their skill, talent and professionalism. Patrice & Associates can help you find employment with their many trusted partners, so take advantage of the upcoming holiday season! So head to http://www.patriceandassociates.com! 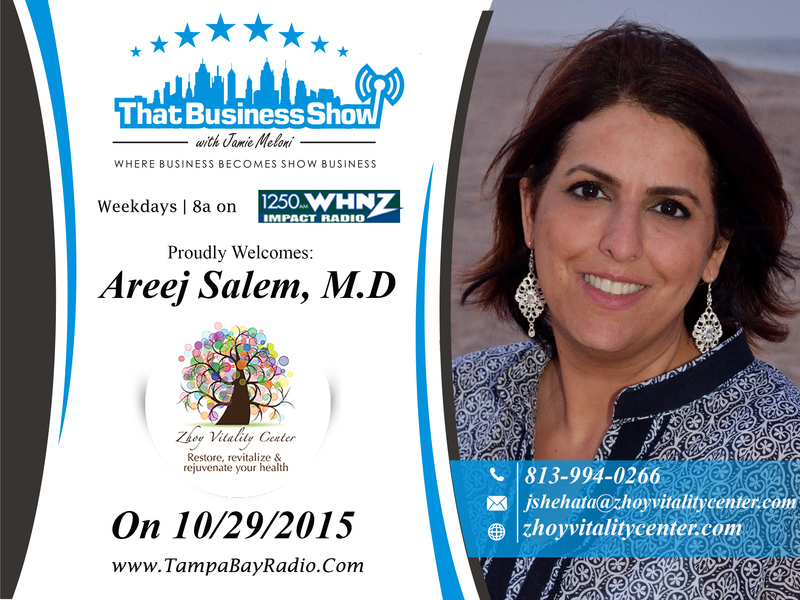 Our second guest on the show was Dr. Areej Salem, a Board-Certified (American Board of Obstetrics & Gynecology, American Board of Integrative & Holistic Medicine) Holistic Medicine Provider! “I spend a lot of time with patients and take time getting to know them. I try to understand their needs, wants and expectations and work with them as a partner in achieving their goals. I also look at the ‘big picture.’” Speaking about all the types of medicine she practices, from preventative, traditional, innovative, regenerative, all the way to anti aging, Dr. Areej Salem and Zhoy Vitality Center can cater to many of your needs! “The knowledge and training to positively impact so many lives from the inside out is very exciting to me. This is the medicine of the future and I feel privileged to be a part of it now.” make sure to head to their website at www.zhoyvitalitycenter.com! Good morning and happy Wednesday! We always love when Wednesday swings around, because here on #ThatBusinessShow, Wednesday means it’s #WorkingWomenWednesdays! Which means that we have two wonderful guests from The Working Women of Tampa Bay Group! The Working Women of Tampa Bay Group was founded by Jessica Rivelli, who is also the CEO. Dedicating to forwarding women in all aspects, from business sharing, emotional and financial support, education, and all the way to political support, The Working Women of Tampa Bay Group is truly a great group for prefessional women to get behind. Our two guests from the group today on #WorkingWomenWednesday was Christina Campbell, Founder and CEO of The Mommy Spot Tampa Bay, promoting “Momtrepreneuership!”. Our second guest was Vivian Dodson, Founder and Head Chef of On The Go Gourmet! Serving you and your family, catering to your needs, On The Go Gourmet is dedicated to quality, service, and professionalism! If you missed today’s episode of #ThatBusinessShow with Jamie Meloni on #1250WHNZ every weekday at 8am, head to http://www.tampabayradio.com to catch any show on demand! Alternatively, head to Jamie’s YouTube Channel at http://www.youtube.com/jamiemeloni! 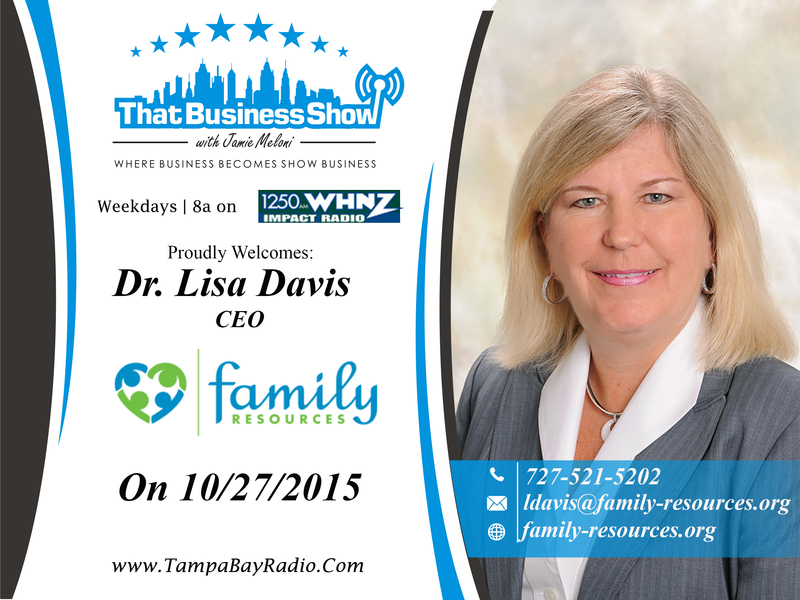 First on the air was our partner, Jessica Rivelli – Founder and CEO of The Working Women of Tampa Bay Group! Founding the group to further women in many aspects, she has brought a group of spectacular women together to empower each other and to rise in their fields! 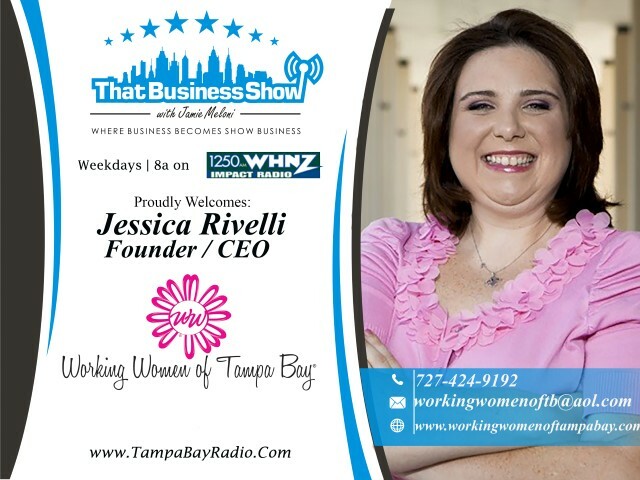 You can find out more about Jessica Rivelli, Founder and CEO of The Working Women of Tampa Bay Group at http://www.workingwomenoftampabay.com/. 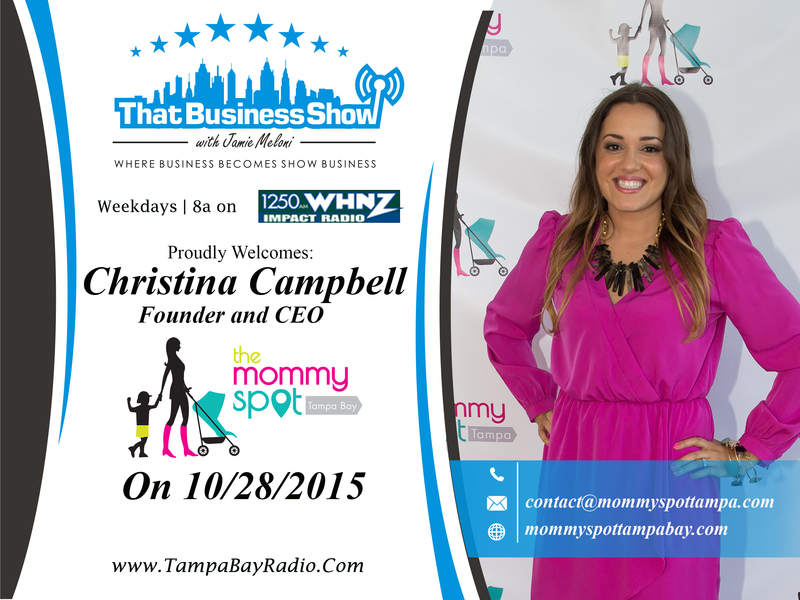 Coming on first on #ThatBusinessShow was Christina Campbell, Founder and CEO of The Mommy Spot Tampa Bay! Describing to us the enjoyment she found in helping other moms immediately became a true passion and she was steadily becoming an influence in the mommy community. A local news station, Fox 13, featured Christina multiple times in a segment where she is able to share “mommy must haves.” With a strong background in sales and an esteemed niche for creative marketing, Christina knew she was capable of branching out on a larger scale. Having attained a great deal of knowledge through her blog, the obvious next step was to begin development on a website specifically geared towards moms in Tampa, and from this, The Mommy Spot was born. Helping “Momtreprenuers”, Christina Campbell #HelpsOurCity! Learn more about Christina and http://www.mommyspottampa.com/! 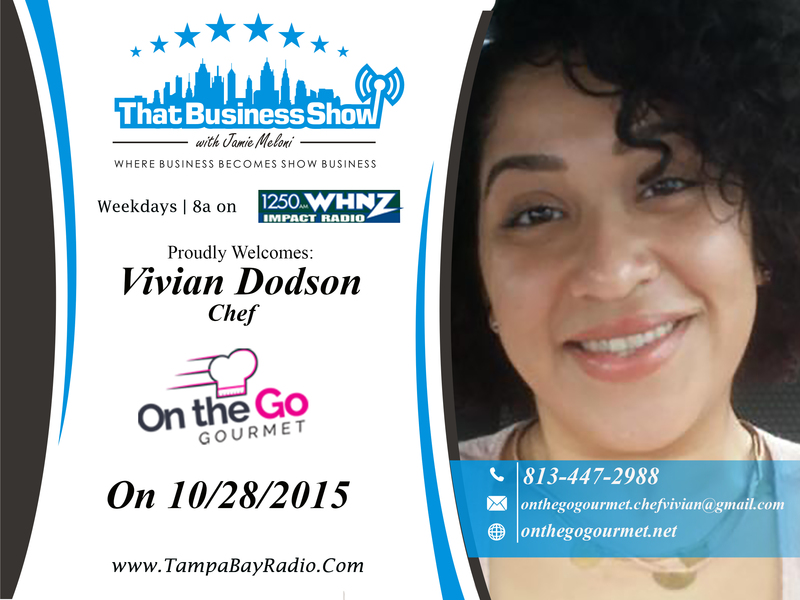 Coming on second on #ThatBusinessShow was Vivian Dodson, Founder and Head Chef of On The Go Gourmet. Working one-on-one with clients which allows her to build relationships, share her knowledge, experience, and her creative recipes, Vivian is dedicated to quality and professionalism. With experience in all food styles from Mediterranean, Latin, Italian, classic, American, and many more, Vivian is a master personal chef! Working with high profile since the very beginning, Vivian has worked for the Tampa Bay Buccaneers, The New York Yankees, and more! She is dedicated to catering as much as she can to the customer, and providing quality service! Find out more at https://www.facebook.com/onthegogourmet! Good morning and welcome to a new week, thank you for joining us this morning for another episode of #ThatBusinessShow with our Host, Jamie Meloni! If you missed today’s episode of the show, make sure to head to http://www.tampabayradio.com to listen or watch any of our shows on demand! Alternatively, you can head over to Jamie’s YouTube Channel at http://www.youtube.com/jamiemeloni! 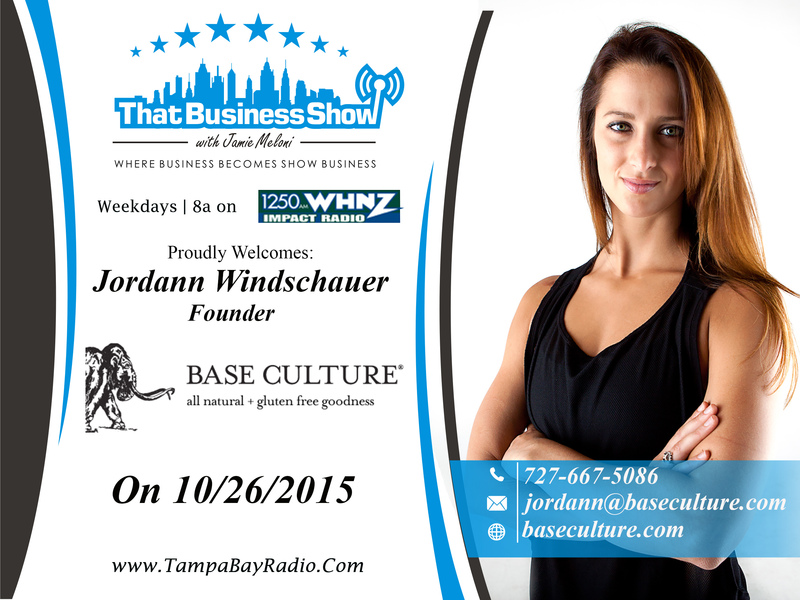 Today on the show, we welcomed Jordann Windschauer, Founder of Base Culture! Base Culture foods is a natural and holistic approach to baked goods and treats that would normally weigh you down. Adhering to the Paleolithic Diet philosophy, Base Culture promotes a healthy lifestyle through the foods you eat! If you are interested in coming on the #MorningAir, head to http://www.tampabayradio.com and fill out the contact form, or email yara@tampabayradio.com to see if we can get you on the show to spread your message to the community! 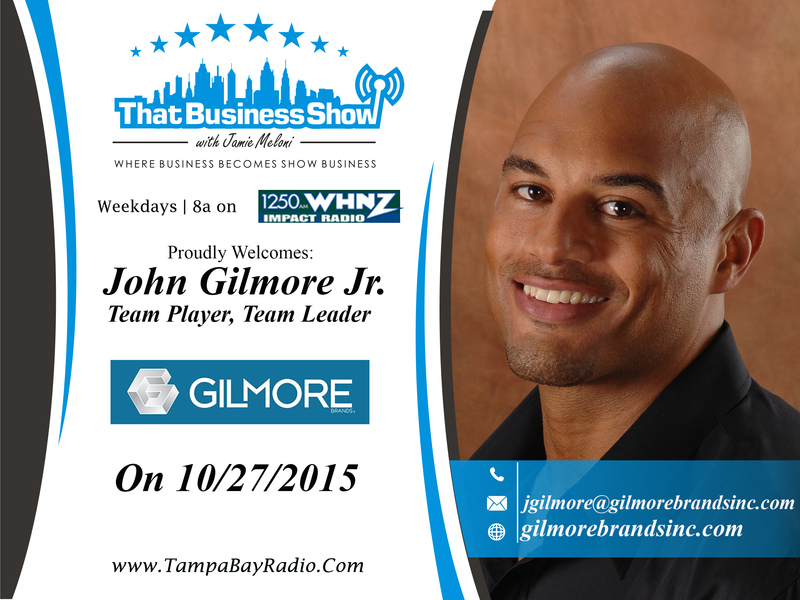 As always, thank you for joining us every weekday at 8am for #ThatBusinessShow with Jamie Meloni! As our guest for the first segment was not able to come, Jamie went ahead and welcomed Jordann Windschauer, Founder of Base Culture on #ThatBusinessShow! Participating in a month long paleo diet challenge at her local crossfit gym, Jordann had the ambition to take the foods she eats to another level, eventually Founding Base Culture! Jordann told us of how her sweet tooth craving was so bad that she even resorted to making her own materials that were paleo friendly so that she could make breads and baked goods, that are restricted in the paleo lifestyle. It was then that she identified a niche to be filled in the world of Paleo-friendly foods. After countless hours spent deciphering recipes and sourcing quality, paleo-friendly ingredients she was determined to create food everyone would enjoy. With her competitive nature, her strive for greatness, and to never settle for anything less, Base Culture was born! Delivering healthy, natural, and gluten free foods, Base Culture knows how to #HelpOurCity! So stay healthy and head to http://www.baseculture.com to place an order now, and feel free to email Jordann at jordann@baseculture.com with any questions! Happy Friday! As we bring this week to a close, we want to thank you for joining us for #ThatBusinessShow with your Host, Jamie Meloni, every weekday at 8am on #1250WHNZ! Airing on the #MorningAir, #ThatBusinessShow is a show dedicated to promoting our local community! Bringing on professionals from all walks of life, #ThatBusinessShow is proud to #HelpOurCity! Joining Jamie Meloni today was Sam Belyea, The Foot Doctor; and Robert Barber! Sam Belyea is Florida’s only Nationally Certified Reflexologist! Also joining us was Robert Barber, Real Estate Advisor, and Co-Founder of Moeller & Barber Real Estate Team, specializing in luxury real estate! If you missed today’s show, then head to http://www.tampabayradio.com or Jamie’s YouTube Channel at http://www.youtube.com/jamiemeloni to catch all of our live streamed episodes on demand! Starting off the show with a medical feel, Jamie Meloni welcomed Sam Belyea on #ThatBusinessShow! Sam Belyea, or The Foot Doctor, is Florida’s only Nationally Certified Reflexologist. He is the owner of The Foot Whisperer Reflexology Institute and his 300-hour Reflexology Training Program has put him on the map as Florida’s up and coming master of Reflexology. Sam’s personal key to success is to always interject humor into the classes he teaches and to know that in order to change the world you have to start with yourself. Discussing his start in the industry as a regular massage therapist, Sam saw potential in a niche industry, “essentially creating an infinite source of money” as in Sam’s opinion, people will always have a need for a Reflexologist, and he is one of the very few in our area! Being a young entrepreneur, Sam has seemed to find his zen! That’s what #ThatBusinessShow is all about, celebrating success in the city! You can find out more about Sam Belyea, The Foot Whisperer, at www.footwhisperer.com! 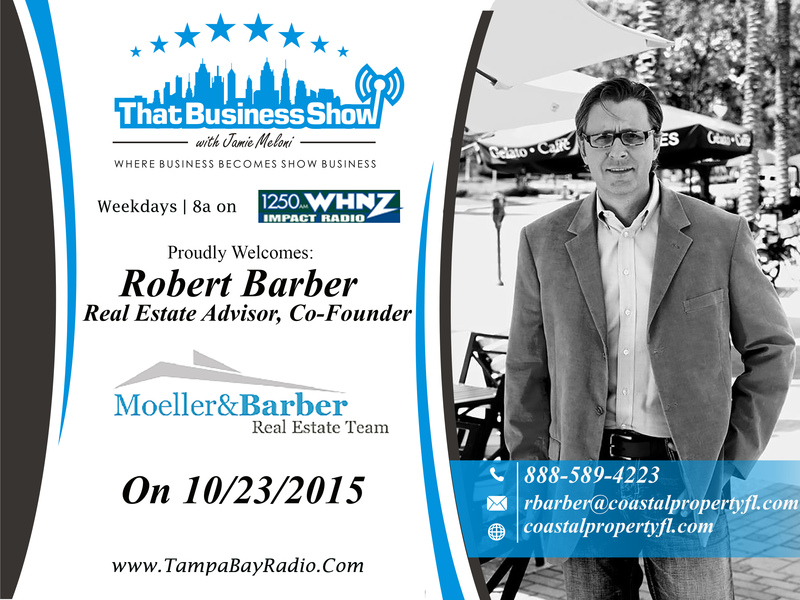 Coming on our last segment, Jamie Meloni welcomed Robert Barber on #ThatBusinessShow! Robert Barber is a leading Real Estate Advisor, and Co-Founder of Moeller & Barber Real Estate Team, specializing in luxury real estate properties and development! Moeller & Barber Real Estate Team has produced millions in sales, and is so successful, they only accept real estate agents who’s sales rack up to beyond $4.2 Million! Specializing in water front luxury residential properties, Moeller & Barber Real Estate Team has sold over 12 3.2 million dollar listings just this year! Discussing the state of the luxury real estate market, the value of the city of Tampa Bay, and the fast-growing city of St. Petersburg, Robert Barber gave our listeners some great information! If you wanted to hear his segment, then head to http://www.tampabayradio.com!